On this day in history, 1777, Lydia Darragh thwarted a surprise British attack on General Washington and the Continental Army, helping turn the tide of the war. By September 1777, the outlook wasn’t so rosy for the Continental Army. The British emerged victorious in every recent battle and then marched triumphantly into Philadelphia. General Washington and his troops attempted unsuccessfully to reclaim the city in October, but were forced to retreat to Whitemarsh. Nearly 30 percent of the city’s inhabitants decided to evacuate. Most of those remaining were either loyalists or neutral. One of the remaining families was the Darraghs, who had emigrated from Dublin, Ireland. William and Lydia Darragh, as well known Quakers, felt they were in relatively little danger, even with British General Sir William Howe’s headquarters right across the street. As Quakers, the Darraghs embraced pacifism, although privately they supported the revolutionary cause. The couple’s oldest son Charles rejected the principle of pacifism entirely to serve under General George Washington in the 2nd Pennsylvanian Regiment. With the British headquarters so nearby, Lydia Darragh was in a favorable position to “keep tabs” on what General Howe and his troops were planning. According to Darragh family legend, she did just that and began acting as a spy for George Washington’s army. Supposedly, Lydia would smuggle coded messages to her son Charles regarding the British and their plans using her 14-year-old son John as messenger. Whether she actually did this or not, we do know that she did send at least one message, and it was extremely significant. In the late autumn of 1777, British troops arrived at the Darragh home demanding the family vacate the premises, as the British army required the building to hold meetings in. Lydia begged the soldiers to allow her family to stay as they had nowhere else to go. She discovered that one of the troops was a distant relation of hers from Ireland, and he intervened on the family’s behalf. The family could stay, but the British could still avail themselves of the space as needed. On the night of December 2, 1977, the family was ordered to remain in their bedrooms while the British officers held a meeting elsewhere in the home. Immediately suspicious, Lydia snuck out of her room, hid in a linen closet and listened closely. She heard that the British were planning a sneak attack on General Washington and the Continental army at Whitemarsh on December fourth – less than two days away. On the morning of the fourth, Lydia obtained a pass from General Howe to travel to Frankford Mill to purchase flour. She did make a stop at mill during her long, snowy journey, but she continued on many miles further until she reached the Rising Sun Tavern, a well known message depot for the revolutionary cause. According to Lydia’s own account to her daughter Anne, when she was en route to the Rising Sun Tavern, she happened upon a colonial officer she knew, and warned him of General Howe’s planned attack for that evening. The officer passed this intelligence along to Colonel Elias Boudinot, who in turn alerted Whitemarsh. Regardless of the specific details, thanks to Lydia Darragh, General Washington was prepared for the battle. General Howe and his troops were caught off guard when the Continental Army came in on with a surprise offensive. 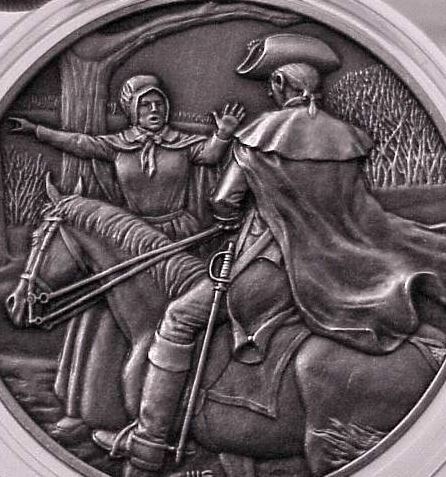 Her actions saved many American lives, and may have even changed the course of the Revolutionary War. A detailed investigation into the incident, specifically how Washington seemed to have known the attack was coming, was headed by Major Andre. Lydia was duly questioned, but the British moved on from her as a suspect very quickly. One thing is certain, the enemy had notice of our coming, were prepared for us, and we marched back like a parcel of fools. The walls must have ears.